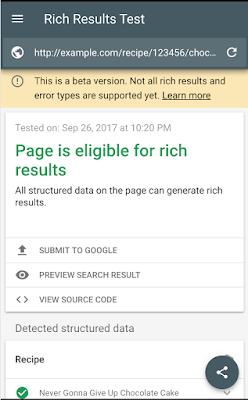 However, Google recently (January 7th) announced on their Google Webmasters twitter account that the Rich Results Test now supports code editing in the tool. They have also been kind enough to prepare a recipe snippet, for webmasters, to sharpen their skills on rich snippet code editing before the changes are implemented on your website. You can view it here. Keep following our blog for more information on new cool tools from Google and other major players in the industry, and learn how to use them best for your SEO efforts. Get in touch with us if you have questions about this or any other digital marketing topics we discuss in our blog, or if you would like to make an enquiry about our digital marketing services.